A year ago, a report was published on Public Health Action (the International Union against Tuberculosis and Lung Disease’s open access journal) by members of the Singapore Tuberculosis Elimination Programme (STEP) and Ministry of Health, looking at tuberculosis cases among Singapore residents by ethnicity, notified between 2002 and 2011. There were 15,622 resident cases of tuberculosis notified during this period, of which 72.7% were of Chinese ethnicity, 18.7% were of Malay ethnicity, 5.8% were of Indian ethnicity, and 2.9% were notified as “other ethnicity”. The majority were male, and the Malays also had the highest proportion of cases (28%) with high mycobacterial load (defined as sputum acid-fast bacilli smear of 3-4+) as well as cavitary disease on their chest X-rays (33%). Compared to the actual population distribution of different ethnic groups, Malays had the highest prevalence of tuberculosis among Singaporean residents. The report also noted that the Malay patients were more likely to be incarcerated at the time of tuberculosis notification (6.6% compared to <2.0% for the rest combined), less likely to be living in private housing (0.7% compared to >4.0% for the rest combined), and also more likely to be clustered by residential address (11.9% compared to just over 7.0% for the rest combined). Unfortunately, multivariable analysis was not performed and the report concluded that Malays have the highest TB rates among the ethnic groups and also increased socioeconomic risk factors for TB transmission and more severe disease. The recommendations were increased vigilance in case management and contact tracing as well as interventions to improve socio-economic conditions in the Malay community. Now, it is actually unclear (and very unlikely) that being of Malay ethnicity itself is a risk for tuberculosis (and the reverse – belonging to other ethnic groups is protective). Conventionally, with regards to infectious diseases, ethnic differences in disease frequencies are almost always explained by socio-economic conditions that result in differences in disease exposure and access to medical care. Selective pressures may result in genetic traits that confer resistance or susceptibility to particular infectious diseases being more prevalent in certain ethnic groups (i.e. sickle cell trait and malaria parasitisation of red blood cells). It would be interesting and relevant research to try to identify the actual significant factors for tuberculosis transmission and disease in Singapore. Unfortunately, there is usually less funding available for such efforts (it is seen as less “glamorous” research, and unlikely to be published in journals with high impact factors – an unfortunate yardstick of measurement for the actual scientific impact of the research). 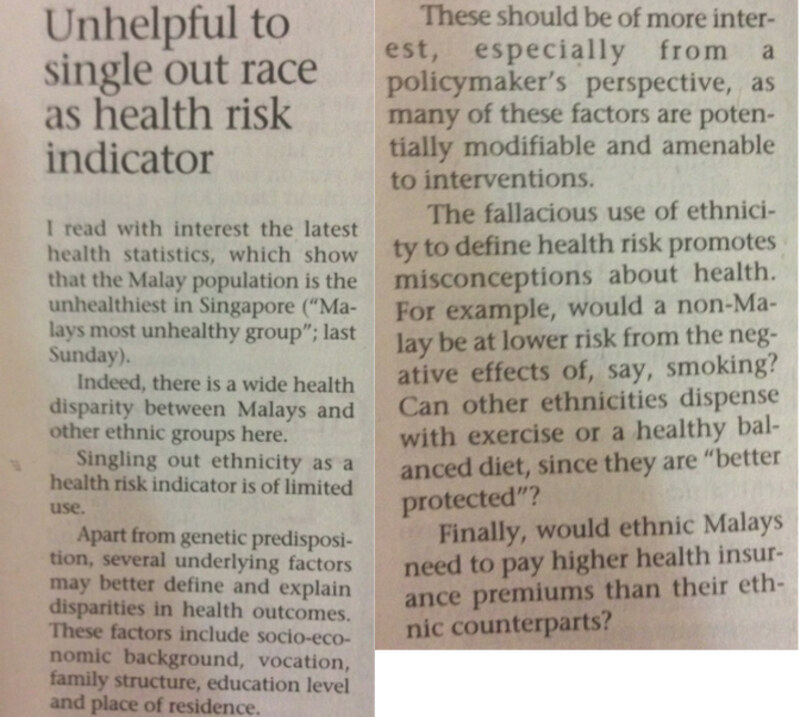 I conclude with an image of a letter in the Sunday Times yesterday that brought up thoughts of ethnicity and infectious diseases in Singapore. The letter writer made several very relevant points with regards to perspectives of health locally. That is my inclination too. Sadly, it remains only a belief until we actually do the studies to track the impact of social-circumstance on the cases. Is there any chance this could come out of studies sneakily funded through graduate student work?